Never Yet Melted » Pete Seeger R.I.P. Jesse Larner, at HuffPo, explains just why Peter Seeger sucked as a folk singer. As someone on the left who loves folk music, I understand that I’m supposed to feel mystically uplifted by the dean of activist folkies. But for those very reasons — because I believe in a humanist political order, and because authentic folk music speaks to me — I never could stand Pete. I don’t question his dedication or his energy. It’s just that I think them unfortunate. His conception of “folk music” has done tremendous damage, and his politics have done tremendous damage, and these things are connected. 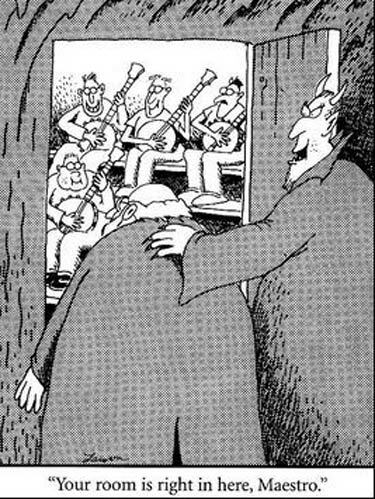 For [the] bowdlerization of the folk tradition — deeply disrespectful to the people who created it, I may add — Pete the tireless popularizer of fake folk music bears much of the blame. Who the hell was Pete? He came from a distinguished family of musicians and academics afflicted with self-conscious class-consciousness; his father, Charles Louis Seeger, although from an old Puritan patrician line, joined the radical Industrial Workers of the World in the 1930s, a form of ostentatiously slumming solidarity that predicted much about his son’s future. Pete was a professional musician from a young age, Harvard dropout, assistant to folk archivist Alan Lomax, and dedicated political activist. He knew everything about folk music, except what it is. Lots of hat tips to Iowahawk. 2 Feedbacks on "Pete Seeger R.I.P." 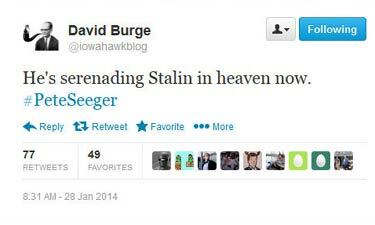 A guy who decided at 92 that Joe Stalin was (his words, not that of a ten year old girl) “mean”, and implied that his worst fault was giving Communism a bad name, is not worth the endless ignorant cloying memorials.